This is a review and detailed measurements of the Singxer SU-1 USB to S/PDIF, AES/EBU, and I²S Audio Bridge (converter). It is on kind loan from a member. I think the SU-1 was released back in 2016. I hear a lot about it so I am happy to have one to review now. Looking on Amazon, the SU-1 costs USD $400 including Amazon shipping. This is a lot of money to pay in this day and age when USB is built into just about every modern DAC. To use it then, it better far outperform native USB interface on DACs as many people believe. There is nothing to select so not much to say as far as usability. The unit was was plug-and-play in Windows without the need for any driver. It is nice to see S/PDIF both in BNC and RCA forms. AES output (XLR) is nice because it is balanced and may help ground loops if your DAC has the same input. Can't imagine anyone using the master clock/word output in consumer arena but it is there nevertheless. As you see, there is an IEC mains socket indicating the power supply is internal. It is a linear affair so not sure why the person who sold it to the member who is loaning it to me, and re-wired it for external power supply input. It was a very clean mod so I just reversed it to AC so that I could test it as others are using it. Absolutely nothing is changed other than run to run variation. There are a few spikes here and there in both instances. All of them are below 120 dB which means they are provably inaudible. So as far as Gustard DAC-X26 is concerned, it has no need whatsoever for the SU-1. Ideal graph here would be below the bottom with no spikes whatsoever. The world is not ideal so even my expensive analyzer has data dependent jitter. 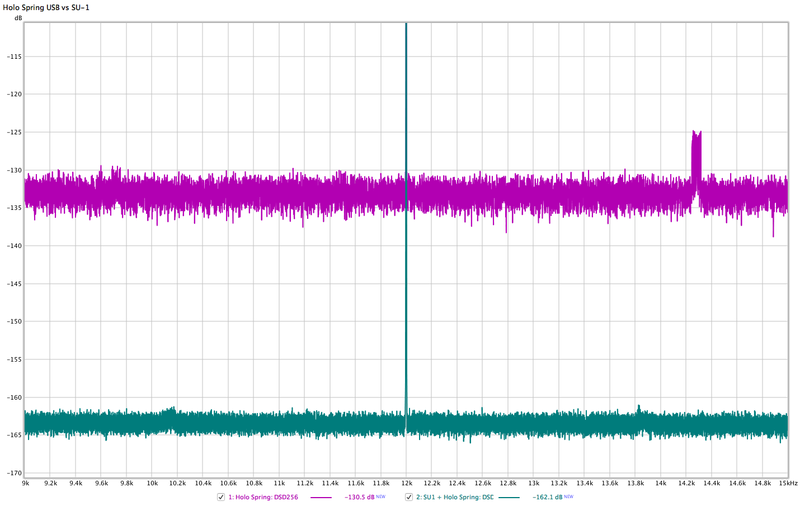 We see spikes correlating with 12 kHz which is the main frequency of J-test (in green). Looping through Singxer SU-1 (in red) makes matters far worse. The tight spikes are the embedded 250 hz square wave in j-test signal. Their existence here means that jitter is created in SU-1 due to data that it is processing. The SU-1 is the same as before in red. The spikes in blue are from Gustard U12. Other than a few more spikes below 1 kHz, the magnitude of the spikes are much lower in Gustard U12. The U12 costs around half as much at USD $170. As we know intuitively, a well designed DAC whose performance is measured objectively, is of no need to external tweaks. If it comes with a USB input and I show it to have good performance, that is that. Don't chase ghosts with such external measures as Singxer SU-1. High performance DACs push my analyzer to the limit. As such, I expect a $400 USB to S/PDIF converter to do the same. That is not the case here. The SU-1 output is quite a bit dirtier than my analyzer output. Comparison to Gustard U12 also shows that the SU-1 is nothing to write home about. The SU-1 clearly has more noise and jitter than it should. Needless to say, I see no reason whatsoever to recommend the Singxer SU-1. If you have an older DAC without USB input, opt for cheaper options like the Gustard U12 or a few others I have tested. Heck, for half as much you can get a S/PDIF converter running on a Raspberry Pi such as Allo Gigione and get streaming option for free! Wondering if or how much would it help with DAC's that performing badly in their USB inputs though ? Thanks for the review. Do you have any chance to see if the I2S connection does any better? Most people I know who own the SU-1 uses the I2S out exclusively to some high-end DACs so I'm curious about that. Would it be possible to overlay j-test results with the USB-powered (cleaner) Matrix x-spdif for reference? For $400 you could get a good DAC. Thank you, Amir for the great review this is everything I wanted to know! Like @bunkbail I do wonder if there is any benefit to be had with using either I2S (or maybe its balanced AES/EBU port). Amir, don't you have Mutec MC-3+ USB in a queue to complete the list of popular converters? I do not. A member had it but has sold it already. Said member lives in Finland so I think he realised shipping back and forth (+import duties upon return?) was a lot of effort/money. I also have Mutec and not using it since I’ve sold Yggdrasil. But l’m quite far from USA too. Yep, sold mine already. These interfaces are still needed regardless of the reclocking features. For example I need the USB->AES conversion for digital active speakers and there haven't been that many products out there that do that. Lately there's been an increase, but a few years back, the choices were quite limited. I think the Matrix x-spdif2 as reviewed by Amir is pretty good choice for AES/EBU. At least compared to the more expensive ones.. Thank you Amir for this good review. I'd be interested in a comparison of the Topping D10 as USB to S/PDIF converter VS the Gustard U12. The Topping is twice cheaper.